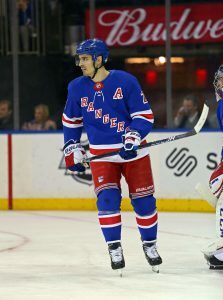 Kreider’s situation is tough: Consistent 20 goal/50 point guy, skilled, plays through pain, decent teammate from what I’ve read. But he’s nearing 30 years old (will be 28 next month) has experienced injuries recently (including concussions) and for a player who depends on his speed, that could spell trouble. NYR might be better off trading him & getting the benefit of more young prospects for the rebuild. Most ri-donk-u-lous question this season: Will the Rangers make the salary cap floor, or will they become another Robidas Island? Ottawa is one thing, but RangersTown??? Zibanejed should be dealt while his value is at its highest. His salary hit is extremely reasonable for a first line center. I would ask for allot and sell high. Don’t deal Kreider because value is not as high. I say continue with the rebuild and trade Kreider AND Zibenejad, if not together for a top young player like Marner (not saying Toronto would, though the depth would be unreal on that team) and sign Panarin. In order to compete these days, you need an explosive top line and not a team loaded with average to slightly above average players. It takes some of that pressure off the youngsters about to come up. Or, move Kreider and Zibanejad for more draft picks/prospects and just go all in and hope the percentages work out with a few who emerge as keepers. Either way, IMHO, the Rangers need to keep with the youth movement and collect as much as they can for the remaining players they have because they’re not going to go get with the current setup.